Expanding the educational opportunities available for the WELL Building Standard. "Producing and providing eLearning courses consumes an average of 90% LESS ENERGY and produces 85% FEWER CO2 EMISSIONS per student than face-to-face training." Fulfill educational preconditions for WELL v2 Projects. With the release of WELL v2, certification requires that a building space promote health and wellness education. The WELL Learning Library was designed to fulfill this requirement and can be implemented on demand. According to the Standard, "all occupants are offered a digital and/or physical library of health and wellness educational materials..."
Learn about WELL v2 Pilot while fulfilling your required CEs. Are you a LEED AP or WELL AP looking to complete your continuing education units? If so, you've come to the right place. 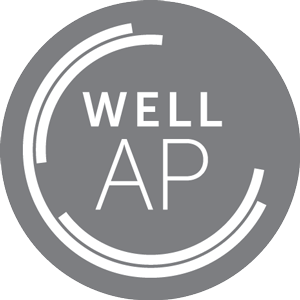 The WELL Learning Library is approved to fulfill WELL-specific CE requirements for WELL APs. In addition, courses fulfill LEED & WELL AP General CE requirements. The buildings we occupy impact our health, well being, and productivity. The WELL Learning Library is a series of eLearning modules focused on the 10 concepts of the International WELL Building Institute's WELL Building Standard (WELL) v2 Pilot. In addition, eLearning modules covering various health and wellness topics are added regularly. Courses fulfill WELL-specific CE requirements for WELL APs and/or LEED & WELL AP General CE requirements. The WELL Learning Library also fulfills on WELL precondition C01 - Promote Health and Wellness Education. This allows WELL v2 projects to easily fulfill this requirement on demand by offering occupants a digital library of health and wellness educational materials. The WELL 101: An Introduction course...was the most CONCISE, INFORMATIVE, and HIGHEST QUALITY production I've ever viewed in the LEED & WELL AP continuing education space. Very user friendly and the navigation is so intuitive and simple. The user network idea is so creative! I liked the course contents and organization...well organized, clear, to-the-point, and precise. I never expected to be working with an eLearning company...I was blown away by their high production value, fun and engaging content, and accuracy in delivering information! ....the classes and information flow well, the speed of the information is quick but not too fast that it feels overwhelming. The visual quality was good. I give it a thumbs up! Not ready? Join our newsletter and stay in touch. Or Join the #WLL community now. Connect with the #WLL community. Copyright © 2019 Cloudless Content LLC. DBA Chromatic Content. All rights reserved.